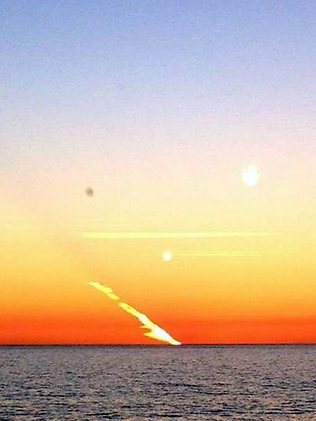 PerthNow reader Gavin Trought snapped the ‘fire in the sky’ as it appeared over Cottesloe just before sunset on Friday, with remnants of the phenomenon still visible in the sky this afternoon. “The weird streak in the sky as seen from Cottesloe last night. I noticed it just before sunset,” he told us. ‘Parents could be jailed for 12 months and have their children put in state care for growing just one marijuana plant in Western Australia under arguably the nation’s toughest drug laws. Amendments to WA’s Misuse of Drugs Act passed on Friday mean people convicted of cultivating a single cannabis plant or processing the drug where a child has suffered harm face a 12-month mandatory prison term. ‘Australia unveiled plans to hit its worst polluters with a carbon tax in the nation’s most sweeping economic reform in decades, smoothing the way for the largest emissions-trade scheme outside Europe with tax cuts for voters and sweeteners for industry.